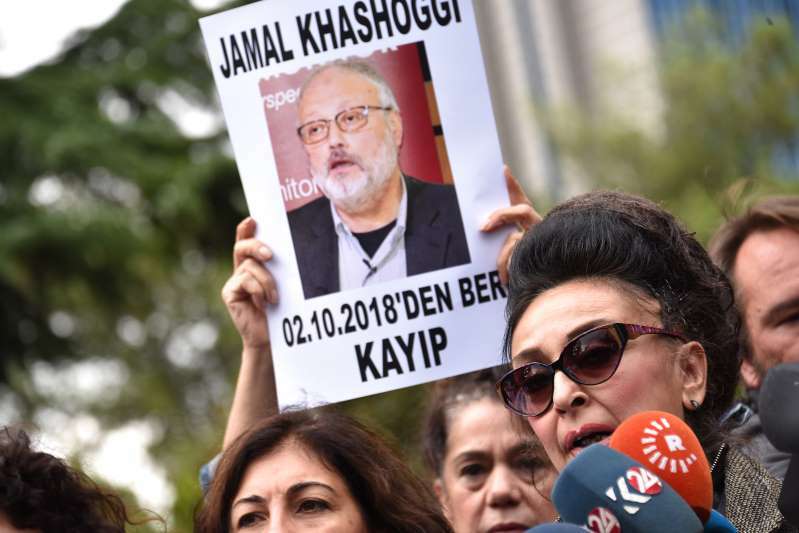 © Depo Photos/Zuma Press/TNS October 9, 2018 - Istanbul, Turkey - Protestors demonstrate at the entrance of Saudi Arabia consulate over the disappearance of Saudi journalist Jamal Khashoggi, on October 9, 2018, in Istanbul. The journalist disappeared a week ago after entering Saudi Arabia's consulate to obtain paperwork required for marriage to his Turkish fiancee. Turkish officials have alleged he was killed in the compound while Saudi officials say he left the building unharmed. It was only six months ago that Saudi Arabia's young crown prince was feted in Hollywood and Silicon Valley, Manhattan and Washington as a reformist monarch-in-waiting, already putting a modernist stamp on an intensely traditional - and fabulously wealthy - desert kingdom. Now the image of 33-year-old Crown Prince Mohammad bin Salman is tarnished by growing suspicion of Saudi state involvement in what may have been a brutal assassination of a critic. And the deepening mystery leaves the Trump administration, which has embraced the House of Saud more warmly than has any other Western leader, in an increasingly awkward spot. The crisis was sparked by the disappearance and possible killing of Jamal Khashoggi, a well-known and well-connected Saudi journalist, self-exiled in the United States, who had for months sounded the alarm over increasingly autocratic moves by the crown prince. On Oct. 2, Khashoggi walked into the Saudi Consulate in Istanbul to obtain some routine paperwork and has not been seen since. A flood of media reports have cited Turkish investigators as saying they believe he was killed soon after entering the building and his corpse disposed of by an elite Saudi security team. Human rights groups, together with Khashoggi's many friends in the Washington establishment, have expressed horror over still-unproven indications that a gruesome fate befell the 59-year-old former Saudi insider, who wrote opinion columns for The Washington Post. "There's almost a sense now that if he wants to do something, no matter how ill-considered, he does it," said Shadi Hamid, a senior fellow at the Brookings Institution's Project on U.S. Relations with the Islamic World. "What's different about his style of governance is the recklessness and the disregard for what we might call normal behavior." Sarah Leah Whitson, executive director for Human Rights Watch's Middle East and North Africa Division, called it "an impossible proposition now to be promoting (the prince) as a reformer" if dark suspicions that Khashoggi was killed are borne out. With a royal family numbering in the thousands, palace intrigue is a constant in the kingdom. But Mohammed's ascent stood out: He was named crown prince last year, vaulting ahead of rivals a generation older, swiftly becoming the principal power behind the throne occupied by his ailing father, 82-year-old King Salman. In a kingdom where the many branches of the royal family traditionally ruled by consensus, the harsh crackdown was a profound shock. The dozens of royals and VIPs the crown prince locked up in the Riyadh Ritz-Carlton included Waleed bin Talal, one of the world's richest businessmen. Saudi Arabia said it recouped $100 billion from the crackdown, but international investors were jarred by the lack of due process. At the same time, the prince's high-profile ambitions to reform Saudi Arabia's oil-dependent economy into a kind of Singapore in the desert, bolstered by innovation and high-tech prowess, were faltering. In the spring, Mohammed won approving headlines around the world when Saudi women were finally allowed to drive, but he also jailed some female activists who had sought an end to the ban - along with clerics, intellectuals and all manner of critics. In August, after Canada mildly expressed disapproval of some of those arrests, Saudi Arabia reacted with a fury that was widely viewed as over the top and tossed out Ottawa's ambassador to the kingdom. For most of his time in office, President Donald Trump has gone far out of his way to be friendly to the Saudis, dispensing none of the long-standing Western admonishments about human rights. Trump's first overseas trip as president was to the kingdom, which afforded him a lavish ceremonial welcome, and Trump's son-in-law, Jared Kushner, forged a rapport with his near-contemporary, the crown prince. Some of that largesse is strategic. The Trump administration views Saudi Arabia, the region's main Sunni Muslim power, as a key bulwark against a common foe, Shiite Muslim Iran. Washington has lent its support to the Yemen war, which has become a large-scale humanitarian disaster, while striking lucrative arms deals with the Saudi government and wooing Saudi investors. In the days following Khashoggi's disappearance, the State Department confined itself to relatively anodyne statements of concern. This week, Secretary of State Michael R. Pompeo weighed in, calling for a "thorough investigation" with transparent results. Trump, who on Monday expressed vague hopes that the situation would "sort itself out," had toughened his stance somewhat by Wednesday. "To reporters, to anybody, we cannot let this happen," he told reporters at the White House. "And we're going to get to the bottom of it." Lawmakers viewed the episode with considerably more urgency. Putting pressure on Trump, a bipartisan group of foreign policy leaders in the Senate sent the White House a letter Wednesday that could formally set the stage for sanctions against the Saudis over Khashoggi's disappearance. Saudi Arabia has continued to disavow any knowledge of Khashoggi's fate. Prince Khalid bin Salman, the Saudi ambassador to the U.S., said reports of the journalist's killing were "false and baseless." The disappearance sent chills through the Saudi dissident exile community. "The prospect of putting critics and activists abroad on Saudi blacklists while awaiting their turn for assassination by death squads is daunting!" tweeted Madawi al-Rasheed, a Saudi visiting professor at the London School of Economics. Meanwhile, new evidence was piling up daily. Turkish investigators pored over surveillance footage and flight records, focusing on the movements of a 15-person team - including a Saudi forensics expert and military and intelligence officers - that traveled to Istanbul just prior to the journalist's disappearance. The Istanbul prosecutor's office announced that it had assigned two senior prosecutors to oversee the case, and Turkish authorities said they had obtained permission from Saudi Arabia to search the consulate. But by late Wednesday, they had yet to enter the building. President Recep Tayyip Erdogan, who is usually quick to assert his government's authority, appeared reluctant to antagonize a powerful neighbor. He has not directly accused the Saudi government, but he has demanded that Saudi officials prove they were not involved. "Whether he was killed is not confirmed yet," said Yasin Aktay, a senior advisor to Erdogan and the first official contacted by Khashoggi's friends when they feared the worst after he vanished. "But it is the highest possibility." (Times staff writers King and Bulos reported from Washington and Damascus, Syria, respectively. Farooq, a special correspondent, reported from Istanbul.